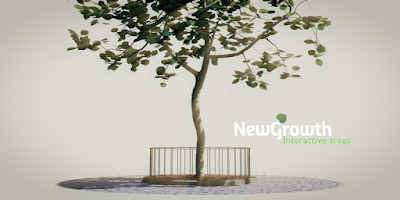 version 0.0.6 provides new functionality to add additional objects to the tree besides leaves. This might be helpful in creating trees with blooms or fruit. Check for earlier articles in this series the archive section in the sidebar on the right. Besides this extra functionality version 0.0.6 fixes two bugs: selecting a saved preset might give an error so now we exclude the various group properties from saved presets (after all a named group might not exist at all in another scene) and in certain situations many identical internodes might be produced. This is not only difficult to skin but results in bunches of leaves as well. This might be a flaw in the original algorithm that we solve by checking whether a new internode doesn't occupy the same position as any existing one. 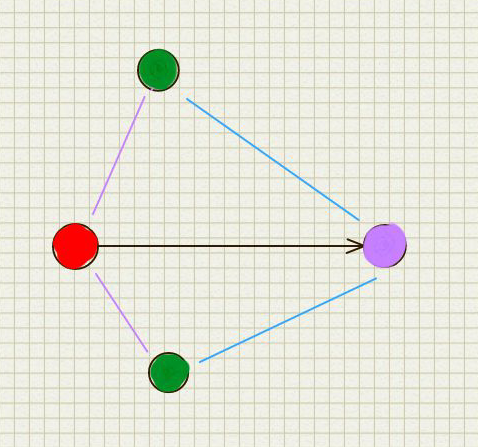 (original branchpoint in red, new branchpoint in purple, endpoints in green. Here the original distances (purple lines) are larger than the kill distance and the new distances (blue lines) even more so.) I wonder if there is a better way to prevent this than just increasing the kill distance (which would result in a very sparse tree) or checking a new branchpoint against all previous ones like we do now (which is quite expensive and rather inelegant).